Lilo & Stitch easily had one of the most memorable marketing strategies of all Disney movies. The character of Stitch clawed its way through classical Disney moments, thereby subverting the outside pressure on the creators to churn out exactly such fair. Despite its obvious task of creating a more modern, Shrek-like protagonist, Lilo & Stitch was produced far away from the corporate restraints that wanted more “boy movies” and more comedy. That shows. No marketing can hide the fact that Lilo & Stitch, is indeed another classic Disney feature. With a heart the size of a young Hawaiian girl, it’s also unique in its kind. What’s marvelous about Lilo & Stitch is that, much like its two protagonists, it has infinite layers. On the surface there’s a ridiculous story of a mutated alien, built to destroy, escaping the clutches of intergalactic judicial system and crashing onto earth to find a young girl in need of a friend. Its sciencefiction premise could have easily been disengaging, but it surprisingly works. Underneath, without any apologies, this is a realistic family story that’s very smart in mixing metaphors with direct monologues. And it has an Elvis Presley soundtrack. Written and directed by Chris Sanders and Dean DeBlois, the story wouldn’t work outside of animation, or at least have a very different feel, it’s surprising how willing the artists were in their real world setting. This isn’t like when Belle ventured into an enchanted castle or like Tarzan, surrounded by talking apes, instead it reminds of that other odd ball out, set in a primarily human environment, Mulan (which it also references). Only now with lush oil painted images and a more prominent and sleek blend of 2D and 3D animation. It doesn’t harm the looks of the human characters either. In fact, the movie is strongest when it allows its two female protagonists to interact and have very painfully honest conversations. The sister bond works wonders because, like anyone with a sibling will attest, its a perfect blend of irrational anger, comedy and unbreakable love. Yes, the leads are still orphans, but with a social worker breathing down Nani’s (Tia Carrere) neck, that story actually grounds the movie. And it’s a welcome diversion of lone male lead characters or girls falling in love. 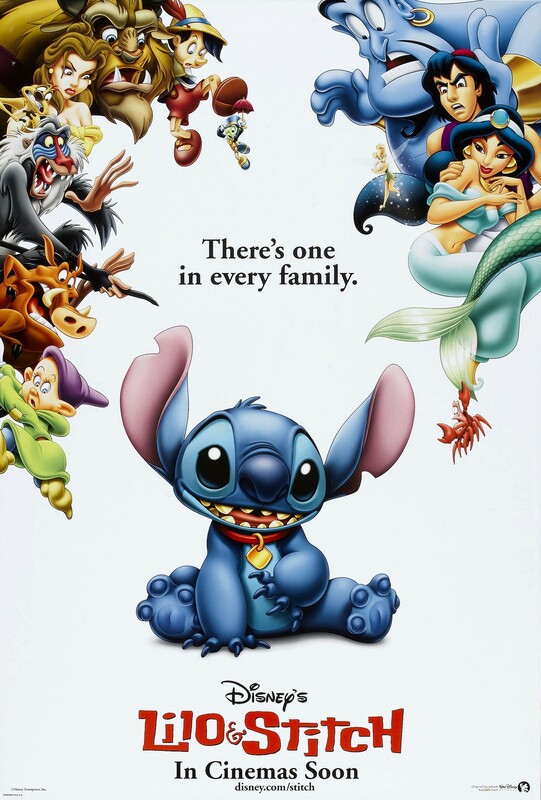 The most admirable accomplishment, however, is Stitch (Chris Sanders). So easily could he have been a functional sidekick, much like the gargoyles in The Hunchback of Notre Dame, welcome in their humor but without development. In this case, that vacancy is occupied by Jumba (David Ogden Stiers) and Pleakly (Kevin McDonald) who just as well may be the first openly gay married couple in a Disney movie. Not only is Stitch not the funniest character in the movie (that privilege goes to Lilo (Daviegh Chase) with all her pre-teen angst), but he’s the outright hero. Without Lilo’s humanity and perseverance, Stitch would have stayed the same. Instead, without uttering too many words, he changes before our eyes from a manic, disturbed beast to a very determined full-fletched character that saves the day. It’s that kind of sensibility that so many other movies, where the human lead gets an non-human friend, miss completely. Without each other Lilo & Stitch would be worse off. With each other they wreck their entire world to the point that evacuating the island seems like the safest route. But at least they are together and because of that, we are better off too.